Here's a diorama I made recently. 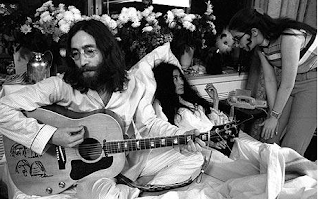 It depicts John and Yoko's second Bed-in for Peace, held in the Queen Elizabeth Hotel in Montreal at the end of May 1969. The first Bed-in was held in March of that year in Amsterdam. The diorama shows the recording of "Give Peace A Chance" (done on June 1 in that room). The scene is complete with hare krisnas, and Timothy Leary, the Harvard professor who was known to advocate the use of LSD. 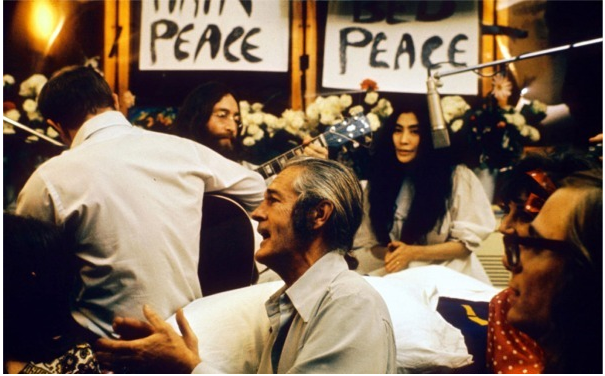 The recording made on this day is the one that was released on record. The Bed-ins were John and Yoko's publicity stunts (i don't mean that negatively) for the cause of peace (the Vietnam War was ongoing). The couple knew their honeymoon would be widely covered in the press, so they came up with the idea to hold court in bed where they could talk to journalists about peace. 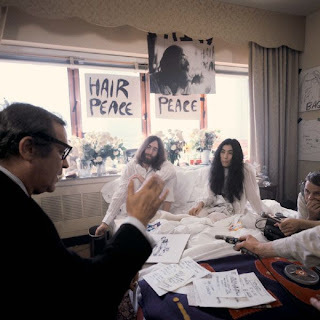 Some in the media were disappointed when they found out the couple were in bed to talk about peace, not to make love publicly, which would have made for a sensational story. Below the model you can see a few shots from the actual Bed-in. Love it! CM It happened in Toronto! Hi CM. Small correction - the bed in actually happened in Montreal - so the Canadians still get credit! There was an earlier one too, in Amsterdam. 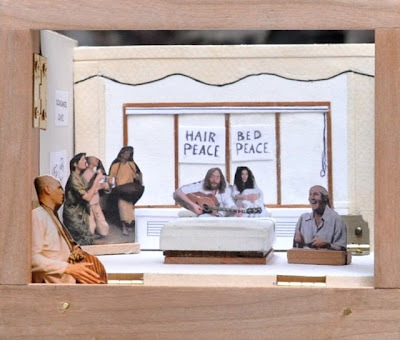 The model I made is of the Montreal Bed in. Thanks for your comments!